Membership is a great investment in your education and your career. For many of you, membership dues are tax-deductible or employer-paid. Whether you are a healthcare provider, educator, researcher, or student, in the U.S. or another country, we invite you to join us, the Georgia Art Therapy Association! Georgia Art Therapy Association (GATA) and the American Art Therapy Association (AATA) support career advancement for members, provide practical support tools and resources, and connect to research and information for those interested in the field of art therapy. All GATA 2018-2019 yearly memberships cost $40. Please contact us with any questions about membership. Receive discounts on GATA events and workshops. Find art therapy job and internship opportunities through the GATA website, listserv, and members. Promote your art therapy practice and services on the GATA website. If you are a member of AATA, you will join GATA at the same time you join or renew your AATA membership. If you join AATA late, be sure to include dues to cover those for GATA. If you are not a member of AATA, you can also join through the AATA website. 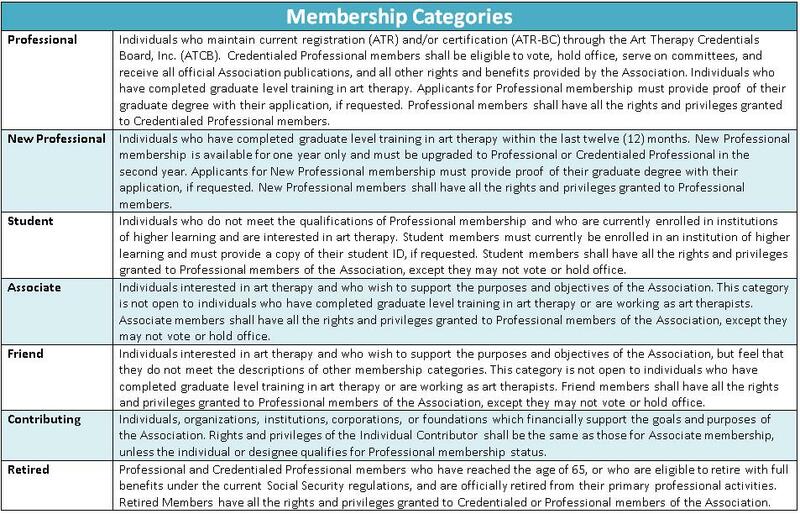 After registering through AATA, please e-mail GATA with the following information: your name, membership type/category, contact information (address, e-mail, and phone number), profession/profession title, any licenses you hold, and your date of membership registration to ensure we have your information for our records. Please include "GATA Membership" in your subject line of your e-mail. Should your contact information change at any time during the Calendar year, please send your updated information to GATA. We have several membership categories listed below. Choose the option fit for you!